TCAA 2010 "A Saddle Story"
A companion article to this one can be found in our Editor’s Journal department TCAA 2010 Show Sneak Preview. Discriminating cowboys have always had a flare for blending function and art. 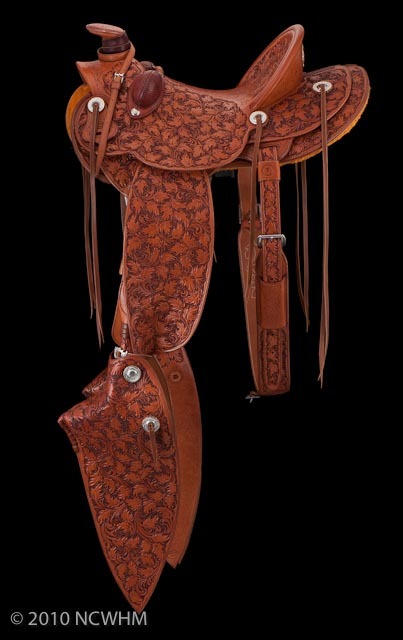 They need a saddle that is serviceable but they want it to make a statement that tells a story as well; a story that connects them with a particular tradition. A cowboy’s saddle says something about his very identity. These are some of the things I thought about when designing this year’s TCAA saddle. Words like: serviceable, respect for tradition, old fashioned taste and uniqueness ran through my mind. I was after a saddle that embodied all of these characteristics. It started with a Bob Severe, hand made Taylor tree; a slick fork with a one hundred year old feel to it. I chose a seven eighths double flat plate rigging with a Harwood stainless steel ring in it. Practical and serviceable, I thought a ring mounted in the flat plate would be an obvious improvement over the old standard ring rig. The cantle binding needed to be a leather stand up style; something a modern day buckaroo would want who has some old fashioned taste. The small round skirts are practical as well, yet offer a classic early twentieth century look. I came to a fork in the road when it came to stirrups. Would it be tapaderos or uncovered doghouse stirrups common to today’s buckaroos? No, this was the Traditional Cowboy Arts Association exhibit, it had to be twenty-six inch taps. Tapaderos would add the flare needed to complete the package. 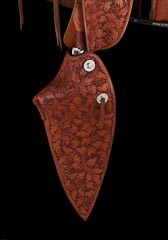 I recall a visit I had some years ago with Byron Price (former director of the then National Cowboy Hall of Fame, and Buffalo Bill Museum) He remarked that a saddle such as this with taps presented a profile that was compelling even for the individual who did not understand what it represented. And now for the decoration, what would look good on this type of saddle? I’d been looking for an opportunity to incorporate maple leaves into a saddle design. This year was my chance. I spent some time this past winter refining my twenty-eight year old maple leaf design. What I didn’t anticipate was the shear number of leaves I would wind up with on the saddle. There are over one thousand carved, sewn, and swivel cut leaves on this saddle. That’s what can happen when you turn loose of the normal restraints of budget and time. Scott Hardy of Longview, Alberta, Canada, once again furnished me with some unique yet sensible silver trim. The decoration on the back of the cantle is an unusual combination of silver and leather. The cantle design consists of an engraved ring with eight fabricated maple leaves on the head of stainless steel pins that fasten the ring in place. In the center is a raised leather medallion with a burned-in bronc figure. I used a hand held wood burning tool to create this image. 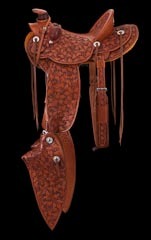 It seemed that this saddle needed a pair of bucking rolls made out of a true North American exotic leather; beaver tail. I began making buck rolls out of beaver tail twenty-three years ago. I know of no one who had ever made any before this time but now there are many folks making bucking rolls out of beaver tail leather. It is extremely durable leather with a natural attractive pattern. As the saddle neared completion, I chose to use an antique finish so that the swivel cut decoration would be accentuated. 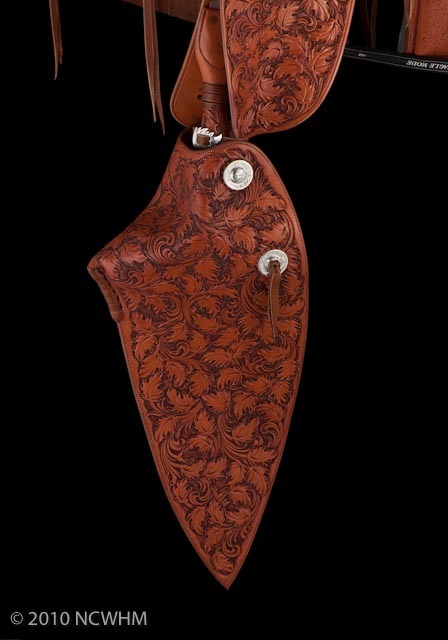 Hopefully we can say “mission accomplished” when we see this saddle and think about things like serviceable, a flare for tradition and a splash of uniqueness. Combining these elements is the task of every TCAA member. Just this week I spent an afternoon with an Idaho cowboy who was making decisions as to what he would like in his new saddle. It’s one of the great joys of my vocation to be a part of this process. Determining what would work for this young man both in the function and the style choices that he was to make that are so much a part of his identity. He spoke of his young son and how someday he would sit this same saddle. Suddenly you realize that we’re building more than just a saddle but an enduring legacy. We are weaving a continuous tapestry that is our Western Heritage. September 24-25, 2010 attend opening activities for an exhibition and sale showcasing the best of saddlemaking, bit and spur making, silversmithing and rawhide braiding from the members of the Traditional Cowboy Arts Association. Exhibition continues through January 2, 2011. Reservations requested for most opening weekend activities. Make your reservations online and also order an exhibition catalog or call (405) 478-2250, Ext. 219. Cary Schwarz is a master saddle maker, artist, writer, founding member of the Traditional Cowboy Arts Association and a contributing writer to High Minded Horseman. You can usually find him hard at work in his shop just outside Salmon, Idaho.